MCE RT Master Mix is a convenient, ready-to-use formulation for reverse transcription. This kit contains gDNA digester which can eliminate gDNA contaminations in RNA samples. 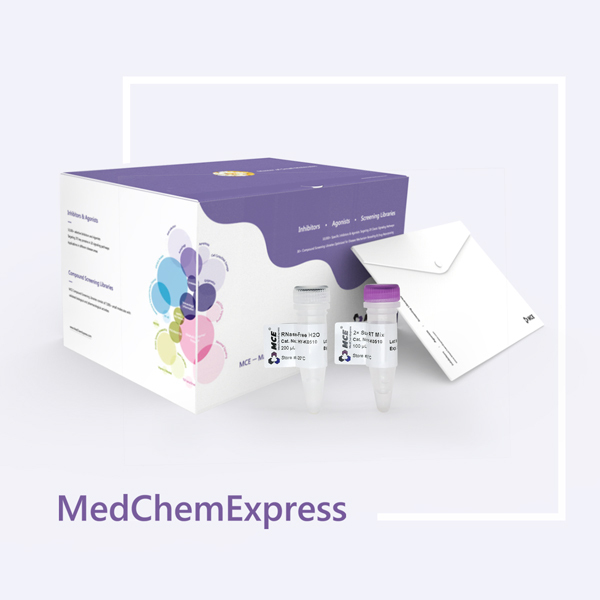 The 2× Super RT Mix contains all the reagents necessary for first-strand cDNA synthesis.The optimized system will provide sensitive and reliable cDNA synthesis. Upon completion of the first-strand cDNA synthesis, the cDNA product can be directly applied as a template in a standard PCR and qPCR. MCE SYBR Green qPCR Master Mix (HY-K0501) is highly recommended for detection of the expression levels of interested genes. • Super-fast gDNA removal in 2 minutes. • Optimized buffer enhances sensitive and reliable cDNA synthesis. • Super-efficient reaction even with low template amounts (total RNA: 5 ng -5 μg in a 20 μL reaction). • The kit provides both Oligo dT Primer and Random Primer. Stored at -20°C, and is stable for up to 1 year. 1 Thaw RNA templates, gDNA digester, 5× gDNA digester Buffer and the 2× Super RT Mix on ice. Mix solutions gently but thoroughly. 2 Prepare the following reaction mixture in a PCR tube on ice. Mix thoroughly, and incubate at 42ºC for 2 minutes. a. For GC rich or structurally complex RNA templates, increasing the RT incubation temperature up to 50ºC may improve the yields of cDNA. b. Stop the reaction by heating at 85°C for 2 minutes followed by chilling on ice. 4 The newly synthesized first-strand cDNA is ready for immediate downstream applications or for long-term storage at -20ºC.